Here is a list the top 5 bar & liquor inventory apps on the market right now (yes, “best” is a subjective term, but having taken more than 5,000 inventories, we have used a lot of them and these are all quality inventory systems and the major players in the field). Each of these has been assessed based on POS integration, accuracy, analytics and pricing. 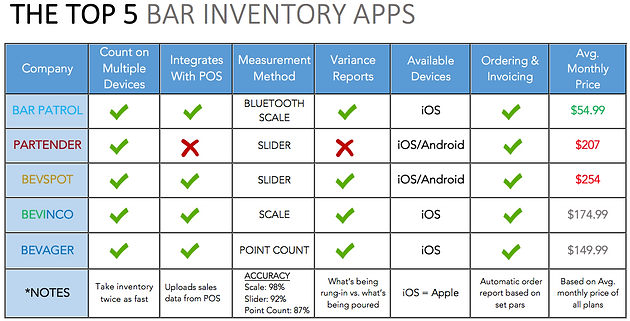 Here is the updated version of this article for best bar inventory apps of 2019. If you want to see Bar Patrol in action, you can click here to watch a demo video on exactly how it works. All of these inventory systems do a great job. The main separation here comes from the measurement method (accuracy) and pricing. They all have very similar functions, yet some are priced ridiculously high. Only one system (since we last looked) doesn’t upload the sales data from your POS system (Partender), which means you have to manually enter the sales data if you want to measure your results which is extremely time-consuming. You can also view a larger version of this chart on our Pricing Page.